Flowchart of possible movie scenes and endings. From Daily Express. 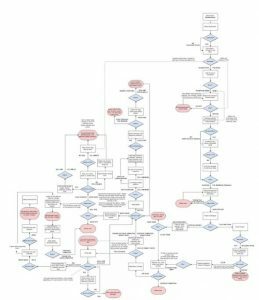 “Bandersnatch” is the first ever, that I know of, interactive film. There have been choose-your-own-adventure books and video games for years. In these books and video games you are given choices, allowing each person’s reading or game-playing experience to be different in plot, characters, ending, etc. This is how “Bandersnatch” works. Keeping your remote in hand throughout the film, you are given choices and the ability to “control” the main character, Stefan. Some choices make little difference but others may have a big impact such as, for example, killing characters. Some “choices” are just an illusion of freewill, as the same thing will happen either way; your choice does not actually matter. If you get to one of the five main endings or hit a “dead end” in the plot, you are instructed to go back to a previous choice and choose something different. This gives you the ability to see multiple different endings and scenes. There is a pathway that will not let you through if you have not chosen and seen specific scenes earlier in the film. This is because you do not have the background information necessary to understand the scene it would show you; you must go back and make different scene choices then try again. As I have watched and “played” “Bandersnatch” four times since its release on Dec. 28, I have seen every ending. However, there are still choices in the film that I have not had the ability to choose and see because there are so many. The movie is brilliant in many ways: its multiple pathways, themes, easter eggs and acting are just a few. I cannot imagine how much planning, writing and filming this film took. As the movie progresses, Stefan begins to realize that he is not the one making his decisions. A certain series of choices even leads to a breaking of the fourth wall in which the director stops filming because Stefan has not done what was written in the script. The film breaks the fourth wall often as characters acknowledge that they are being controlled, speak to you, ask you what to do and know that what they do does not matter because they will be back in other scenes. The movie takes place in 1984, following Stefan’s creation of the first choose-your-own-adventure video game, “Bandersnatch”, based on the popular choose-your-own-adventure book “Bandersnatch”. Therefore, “Bandersnatch” is about “Bandersnatch” which is about “Bandersnatch”; this is what I mean about the film being a creative masterpiece. There are multiple levels to the story, reminding me of “Inception”. Sometimes you do not know the difference between what is real and what is not. Two of the five main endings lead to a bonus scene which shows Stefan listening to a tape of seemingly random sounds. If you record these sounds and turn them into a QR code using a ZX Spectrum emulator, you can scan the QR code and play the “Nohzdyve” video game that Colin was working on in the film – “Nohzdyve” and “Metl Hedd” are references to “Black Mirror” episodes. Another bonus scene shows a woman creating the movie you are watching. She mentions that it might be sold to Netflix and that she wanted to make a film about the creation of the “Bandersnatch” video game in 1984. Rotten Tomatoes gives it a 74 percent and IMDb gives it a 7.6/10, both saying that while it is innovative and forward-thinking, it is not entertaining enough to watch multiple times. Obviously I disagree, as I have watched it four times already in an attempt to see more scenes.